Zink To Offer Miniature Ink-Free Printing | OhGizmo! By David Ponce on 01/31/07 • Leave a comment! Company Zink has announced the development of a printer so small, it could fit in your pocket alongside your cellphone, spare change and half-chewed gum. It would be able to print your pics without ink. How would it do this? By using some special paper. “Images are created when a heated printer head comes into contact with a sheet of specialized paper,” which is actually a polymer containing three crystalline layers. Varying temperatures and pressure points create the pixels of color, and just in case you figure out your latest printout doesn’t showcase your eye color as well as you’d hoped, it’s recyclable. 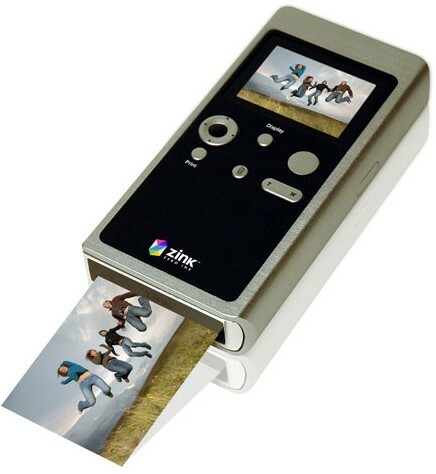 It would be able to print small images, 2- x 3-inch, in color. The company’s first products are likely to be a $100 pocket printer, or a $200 printer/camera hybrid. The special paper isn’t that expensive, at $20 for 100. It’s not clear just when the device might hit the shelves, though Zink will be showing off the technology at Demo ’07.